Maxentius, en liten juvel i hjertet av Roma, Colosseum. Leilighet med to soverom, stue med kjøkkenkrok, bad. Leiligheten har utsikt over en gårdsplass dekorert med gamle romerske søyler, i en kontekst av sjelden arkitektonisk skjønnhet. Beliggenheten er unik som bygningen ligger mellom Colosseum, Palatine, Forum Romanum og Capitol. Du kan gå til de viktigste stedene i kulturell og kunstnerisk interesse av byen. Den Vittoriano, et steinkast fra leiligheten, tilbyr interessante kunstutstillinger. The Capitol, en av de vakreste torgene i Roma, vil du nyte en fantastisk utsikt over Forum Romanum og Palatinerhøyden og nedstigningen av Fori Imperiali vil ta deg til Forum of Augustus og Colosseum. Great accommodating host. We were very happy there. Everything was fabulous. Beds were comfortable, sheets were soft, comforter was down, shower was best we had of any b&b in Europe!!! Location is terrific. Many of the main sites are in easy walking distance, including the forum, the colosseum, circus Maximus and palladium hill. There are plenty of markets and cafes in the area, which the host, Lucy, is kind enough to point out when you first get there. Would recommend this place for anyone visiting central Rome. My mother and I stayed in this apartment for four days in late March. 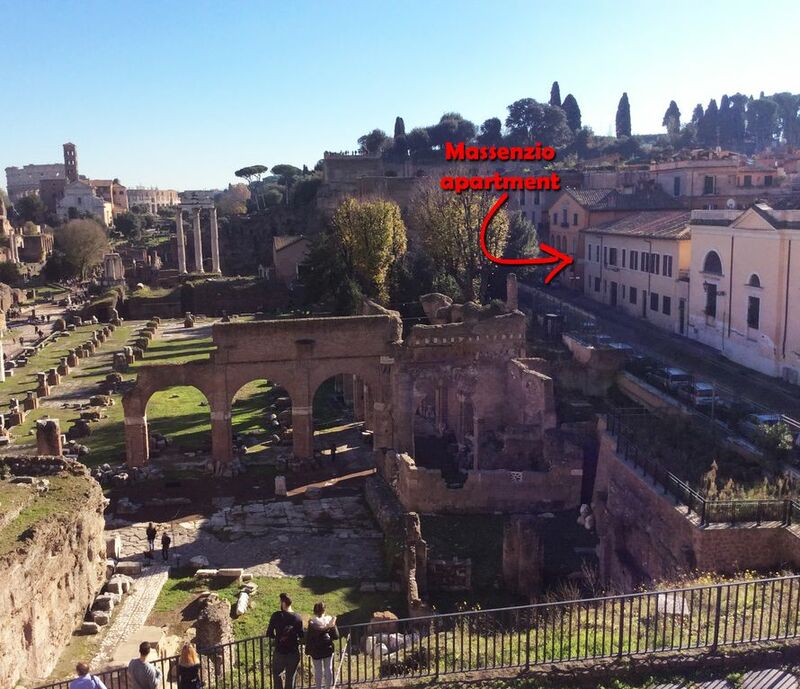 The location of this apartment is very convenient to many of the sites especially the Musei Capitalonini, the colloseum, the Roman forum (right next door) and the Paletine. Lucy was extremely helpful and spoke English. The only little thing I will say, is that the floors were not very clean and we were given one towel each which were not the best quality. Also, the pillows were very flat and thin. We believe this may be an American thing, and we are just accustomed to better linens. Also the shower was extremely small, we could not bend down to pick anything up while in the shower. If you are a big person, you will not be able to shower here. We enjoyed our stay very much and we like Lucy a lot! This review is mainly to put people on notice of the small shower and linens. We totally loved the apartment. It's location was very convenient. Thank you so much Debbie, you have been wonderful guests. I hope to see you again in Rome! Thank you, it was a pleasure to host you. I hope to see you again in Rome. This is a little gem in the heart of Rome. Quite literally footsteps from the Forum and other Antiquities. Capitoline Hill and Circus Maximus are also easy walks. Luciana, the lovely landlord, showed us the nearby specialty grocery and also the warm, welcoming restaurant Normale, which again met our needs nicely. This apartment invites a couple or small family to embrace the rhythms of urban Rome, and thus to be open to appreciate the richness of the extraordinary surroundings which are literally footsteps or easy rides away. We as a couple would return in a heartbeat. Has all the amenities for home cooked meals and is right in the center of the most ancient part of Rome. Local cafe and grocery are definitely convenient. The price is great too. Leiligheten ligger i en gate med utsikt over Fori, i en fortryllende og uforlignelig posisjon for å fullt ut nyte skjønnheten i det gamle Roma. Det ligger et steinkast fra Colosseum, Campidoglio, Palatine-høyden og generelt fra de mest interessante historiske og kulturelle severdighetene i byen som kan nås komfortabelt til fots. Jeg foreslår en fortryllende tur gjennom Capitol gate, forbi Capitoline Wolf, symbol på det gamle Roma, Via di San Pietro i fengsel for å nå Via dei Fori Imperiali fører til Colosseum. Men du kan slappe av på Aventino, i hvis hagen Orange Tree kan du nyte en fantastisk utsikt over byen i tillegg amaze de vakre kirkene i Sant 'Anselmo og basilikaen hellige Bonifatius og Alessio. Personlig stopper jeg ofte i Sant'Anselmo-hagen for å få en kaffe nedsenket i roen og ånden av stedet. Hvis du elsker god mat og kvalitetsvin, ikke gå glipp av, lørdag eller søndag, å hoppe i markedet på null km ca 200 meter fra leiligheten. For de andre dagene ta en tur fra matbutikken til torget i Fienili, finner du god mat og gjestfrihet.